Area of occupancy of this species has been drastically reduced (near 50%) with continuing decline of populations. Range extent has also been reduced as the species is extirpated from several U.S. states (Indiana, Kansas, Nebraska, Ohio) and many of the remaining populations have poor or no viability. The species has largely been reduced to a relatively few disjunct sites, some of which may not be capable of reproduction either through loss of fish hosts or adverse environmental conditions (e.g., hypolimnetic release from reservoirs). Only the Gasconade and Meramec Rivers of Missouri and perhaps also in the Upper Clinch River, Tennessee are fairly stable for now with the remaning populations in decline. Historically, this species occurred throughout much of the Mississippi River system with the exception of the upper Missouri River system, uppermost Ohio River system, Cumberland and Tennessee River systems, and some tributaries in the lower Mississippi region of Arkansas. 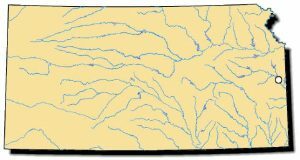 Historically, it is known from 45 streams in 15 states including: upper Mississippi River system (Mississippi River); lower Missouri River system (Missouri River? ); Ohio River system (Ohio River); Cumberland River system (Cumberland River); Tennessee River system (Tennessee River); and lower Mississippi River system (Mulberry, Ouachita Rivers). Two occurrences reported recently from the Duck River in a reach less than 30 miles long. Comments: The spectaclecase has an elongated shell, its length being three times its height. The ventral surface is concave which gives the shell a banana-shaped appearance. The color is dark brown turning toward black with age. The spectaclecase is found in-between and under the edges of large boulders in deep stretches of rivers. 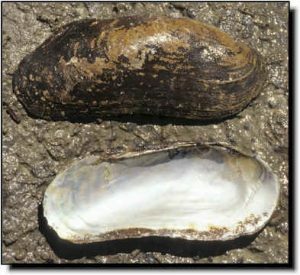 This habitat is not typical of most other mussels which usually inhabit gravel or silt substrates. Relic shells were recently found in the Marais des Cygnes River but no live individuals have been found in Kansas.